GRAB SOME GREAT VALUE QUALITY SPORTSWEAR. Several months ago Tribesports my favorite sports orientated social site, launched a Kickstarter campaign to raise funds to produce their own range of sports wear. As I had been a member of the site for many months and benefited greatly from the environment and training tools on the site, without having to pay a penny for it, I was keen to do my bit to support them in their venture. If you have not come across Kickstarter or crowd funding before it basically involves raising funds to finance a project from people through the power of the internet. You pledge some cash and in return you get some benefit from the project once it is completed. In this case pledges receive items of the new sports wear from the first production run. Anyway I made my pledge, more as a show of appreciation than because I wanted new kit, and forgot all about it. Until last week that is, when a package arrived, rather conveniently on the eve of my birthday. In it I found my long sleeved, white technical shirt and what a thing of beauty it is. The Tribesports team had promised quality and they certainly delivered. The fabric is incredibly light and very soft, so no nasty chaffing. All the stitching is superb, you don’t need to be a tailor see how secure and accurate it is. It is also really stylish in the Tribesports white with orange detailing. I recommend you check out the Tribesports Shop. 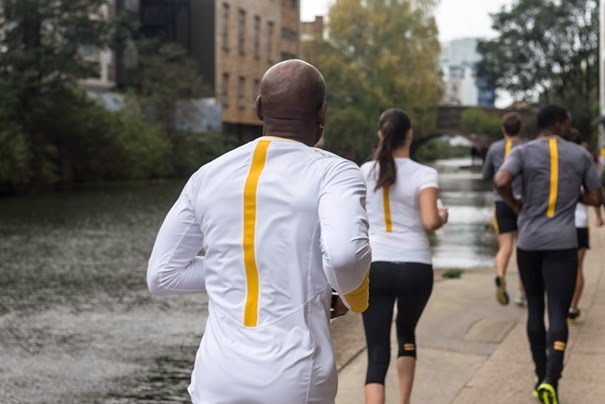 The ethos behind this new range is to give us, the sports people, a top quality product, using the best and most advanced materials to create sportswear designed by top designers, and sell it for the lowest possible price. To do this they have shunned celebrity endorsements, expensive advertising and instead are relying on the quality to speak for itself and for the word to spread through the sporting community about just what great value this kit really is. Definitely the nicest bit of kit I own. So if you like this idea please have a look and share this with your friends, they deserve the support. Lets shun the all powerful brands in favour of real quality and value.